Multiple types of laboratory centrifuge are available to meet the specific requirement of component separation. These are usually classified as the microcentrifuge, medium capacity centrifuge, and large capacity centrifuge. The widening applications of laboratory centrifuges are expected to drive the global market in the coming years. The growing number of diagnostic centers is expected to be the key growth driver for the global market. According to the research report, the global laboratory centrifuge market is expected to be worth US$1,833.29 mn by the end of 2025 as it climbs up from US$1,400.00 mn in 2016. During the forecast years of 2017 and 2025, the global laboratory centrifuge market is expected to rise at a CAGR of 3.1%. The global laboratory centrifuge market is segmented into five broad segments on the basis of capacity, components, temperature, end-user and geography. By capacity, the market is segmented into microcentrifuge, medium capacity centrifuge and large capacity centrifuge. Microcentrifuge segment accounted for leading share and is projected to slightly lose its market share to medium capacity centrifuge by the end of 2025. Hospitals and diagnostic centers are the key shareholders of microcentrifuges. Medium capacity centrifuge segment is anticipated to record highest growth rate during the forecast period owing to multiple applications of these equipments in the life science industry and its ability to accommodate different types, sizes and volume of centrifuge tubes. Large capacity centrifuges are widely used by the biopharmaceutical companies for batch production, sample preparation, cell harvesting and microfiltration of aqueous solutions. Also large capacity centrifuges are being frequently used by the blood banks for blood component separation. The global laboratory centrifuge market by component is segmented into instruments and rotors. Instruments segment dominated the market and is projected to lose its market share to rotors segment. The rotors are further sub-segmented into fixed angle rotors, swing out rotors and fixed angle rotors. The swing out rotors segment is projected to record highest growth rate during the forecast period and is anticipated to marginally gain its market share by the end of 2025. By temperature, market is segmented into refrigerated centrifuge and non-refrigerated centrifuge. The end-user for laboratory centrifuge includes the hospitals and diagnostic centers, pharmaceutical and biotechnology companies, blood banks and academic and research institutes. Geographically, the global laboratory centrifuge market is segmented into North America, Europe, Asia Pacific, Latin America, and the Middle East and Africa. The developed regions such as North America and Europe accounted for leading share of global laboratory centrifuge market in 2016. The large base of biopharmaceutical industry and diagnostics laboratories in these regions led to leading share of these regions. Moreover rapid expansion and increasing number of diagnostics labs in these regions would propel the demand for laboratory centrifuge during the forecast period. Asia Pacific region is projected to expand at exponential growth rate owing rapidly improving healthcare facilities in the countries like India, China, South Korea, and Malaysia. Japan dominated the Asia Pacific laboratory centrifuge market whereas China is anticipated to record exponential growth rate during the forecast period. Latin America and Middle East & Africa regions are projected to maintain steady growth rates during the forecast period. 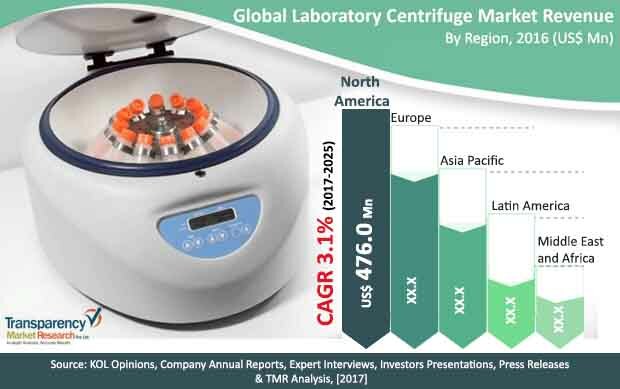 Major players operating in the laboratory centrifuge market include Sartorius AG, Thermo Fisher Scientific Inc., Eppendorf Group, Andreas Hettich GmbH & Co.KG, QIAGEN N.V., Hitachi Koki Co., Ltd. (Subsidiary of Hitachi, Ltd.), Beckman Coulter, Inc. (Subsidiary of Danaher Corporation), Sigma Laborzentrifugen GmbH, KUBOTA Corporation, and Cole-Parmer Instrument Company, LLC. ( Subsidiary of GTCR firm). Centrifuge is a laboratory equipment used for the separation of particles from sample solution based on the size, shape, viscosity of medium, density and rotational speed. Centrifugation technique is based on the method of sedimentation of fast-tracked gravitational force accomplished by a rapid rotation. In laboratory, centrifuge is primarily used for the separation of cells, proteins, enzymes, antibodies, viruses, nucleic acids, viruses, microbes, and other cellular components. These are also used in biochemistry labs for isolation and characterization of different chemical compounds, for the research purposes. Laboratory centrifuges have broad applications in the life science industry for cell culture, batch production, biopharmaceutical industry for drug discovery & development and in molecular biology fields for analysis of PCR, nucleic acids, proteins & enzymes, and in healthcare facilities for diagnosis of broad range of infectious and chronic diseases. There are multiple types of laboratory centrifuges available with varying rotational speed, sample handling capacity, temperature control facilities and safety features. These are generally classified as microcentrifuge, medium capacity centrifuge, and large capacity centrifuge. The rising demand from healthcare facilities and rapidly growing life science industry are projected to be key driving factors for the expansion of global laboratory centrifuges during the forecast period. The biopharmaceutical industry is one of the fastest growing segment of pharmaceutical industry growing around 8% CAGR and which is almost double than that of pharmaceutical industry. The wide applications of laboratory centrifuges in biopharmaceutical industry for the isolation biological components from the solution, production of biologics products, evaluation of suspension and emulsions, and determination of molecular weights of colloids such as polymers, proteins, and other macro as well as micro-molecules would drive the demand for the laboratory centrifuges during forecast period. Also, the increase in pharmaceutical R&D budgets, by both government as well as private players to support new product and technology development would drive the demand for centrifuge equipments during forecast period. The increasing number and expansion of clinical and diagnostic laboratories worldwide is anticipated to be the one of the key drivers for the laboratory centrifuges during forecast period. The technological advancements in centrifuge equipments such as increased sample handling capacity, enhanced safety feature, automated rotor recognition and imbalance detection features, wireless connectivity and remote monitoring, quick start manuals and multilingual instruction, etc. factors are encouraging the uptake of newer laboratory centrifuges. On the other side, the fragmented market to domestic players creates highly competitive environment for leading international players. Also, alternative methods for component separation, such as chromatography, automated blood component extractor devices etc. are likely to limit the growth of market during the forecast period. The global laboratory centrifuge market is broadly segmented into five segments on the basis of capacity, components, temperature, end-user and region. By, capacity, the global laboratory centrifuge market is segmented as microcentrifuge, medium capacity centrifuge and large capacity centrifuge. By, component market is segmented as instruments and rotors. The rotors are further sub-segmented as fixed angle rotors, swing out rotors and vertical rotors. By temperature, the market is classified as refrigerated and non-refrigerated centrifuge. The end-user of laboratory centrifuges includes hospitals and diagnostic laboratories, pharmaceutical and biotechnology companies, blood banks, and academic and research institutes. Geographically, the global laboratory centrifuge market is segmented into five regions: North America, Europe, Asia Pacific, Latin America, and Middle East and Africa. The competition matrix section included in the report is likely to assist the existing players to increase their market shares and new companies to establish their presence in the global laboratory centrifuge market. The report also profiles major players in the market based on various attributes such as company overview, financial overview, SWOT analysis, key business strategies, product portfolio, and recent developments. Major players profiled in the report are Sartorius AG, Thermo Fisher Scientific Inc., Eppendorf Group, Andreas Hettich GmbH & Co.KG, QIAGEN N.V., Hitachi Koki Co., Ltd. (Subsidiary of Hitachi, Ltd.), Beckman Coulter, Inc. (Subsidiary of Danaher Corporation), Sigma Laborzentrifugen GmbH, KUBOTA Corporation, and Cole-Parmer Instrument Company, LLC ( Subsidiary of GTCR firm).